MS2 and MS3 by Intertechnik used to be our classic speakers for jazz and classical music. 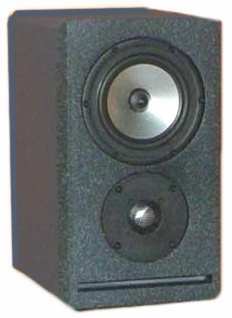 This range of monitor speakers was revived by Udo Wohlgemuth; the monitors are equipped with Seas KT 27 G and W 151 Al drivers. And for those of you who prefer even more bass we have the MS5 comprising the same drivers but with an additional CA 260 AL bass driver. "After those lengthy technical descriptions our readers are quite rightly expecting a description of the sound by the two successors of well-known predecessors. First I need to emphasise that the two contenders, MS 2 and MS 5, couldn't be more opposite. The former is a slim shelf speaker, while the latter is a grown-up floorstander with physically more width than depth. It starts already with totally different designed crossovers; but both eventually showed the same results. One remark beforehand: the sound characteristics of these two speakers couldn't be more alike. Airy, open, with attention to detail but never obtrusive, that's how vocals and instruments came across. Three-dimensionality was almost identical, although I don't like to look at restricting walls. Therefore, I had to close my eyes when listening to the shelved MS 2 in order to do justice them. Out of consideration for the small speaker I didn't yet pick those CD's that have to be enjoyed with a lot of bass to make the music flow over. Eric Clapton played "Unplugged" displaying the typical string picking sound coming from his acoustic guitar without being pushed to the fore. The metal diaphragms showed exceptional fine dynamics ensuring that applause didn't sound like a frying egg in a hot pan, something that cannot be said about many of the metal diaphragm variety. Listening to KT Tunstall's "Other Side Of The World", it became clear that a considerably higher bass ability was required, a task that was accomplished with adequate volume by the MS 2 being placed close to wall. However, while here the W 151 AL showed already quite a piston displacement to replicate a bass drum, the CA 26 AL hardly ever moved at the same volume. As expected this caused a less fatiguing listening experience. Obviously, the MS 5 was head and shoulders above the MS 2 when the classics of the eighties had their say. The sound coming mainly from computers, showing off hullabaloo from bottom-end and tops was certainly the domain of the big floorstander. All of a sudden I even liked Bronsky Beat, Image and Depeche Mode, although I prefer the music of the late sixties and early seventies, where less programming and more virtuosity was required. Therefore, I granted Dire Straights the right to perform last, a band that dominated possibly like no other the 8th decade of the last century. "Sultans Of Swing", "Private Investigation" and "Brothers In Arms" are prime examples the MD 5 were just waiting for."